The Bruce Trail Conservancy started in the 1960s with four naturalists working to conserve the natural wonders along the Niagara Escarpment. Today the conservancy has obtained many gorgeous properties spanning over 895km of main trail and 435km of side trail from Niagara to Tobermory. The section of the Bruce Trail called “Silent Valley” is one of these properties filled to the brim with geological and cultural treasures and heritage. While on the FAM Tour, presented by Grey County Tourism, we explored this valley with Bruce Trail member Ron Savage who enticed us with his vast knowledge about the eclectic history of the property. Silent Valley truly is a wonder to behold and let me tell you, you will have to come visit to experience it all yourself! One of the most fascinating aspects of this hike is the geological wonders within it. Ron explained to us that millions of years ago our area, and most of Ontario, was actually the bottom of a sub-tropical inland sea below the equator. This sea would have been full of species such as sponges, coral and marine animals. Once these creatures’ lives ended they fell to the bottom of the sea, and then over time pressure fused them together creating the limestone that we now call the Niagara Escarpment. There are many fossils left over from these creatures that you can find along the Silent Valley Hike. Furthermore, all along the hike you can find different rocks and boulders with interesting formations. Ron told us that these formations were caused during the last ice age around 10-12 thousand years ago. At that time there were glaciers over the land rising up to 2,000m high. Once these glaciers started to melt, they created raging rivers beneath the glaciers which resulted in boulders with many odd formations and crevices which you will undoubtedly see during a hike at Silent Valley. Moreover, although we did not get to see them on our hike, there is a large crevice as well as a cave system that I am sure is a wonder to explore. Clearly there is lots to see during this hike and I will have to make a second trip to see it all! Another unique aspect of this particular section of the Bruce Trail is not only the natural hike you will experience, but the hike through history as well. The first settlers of the property was the Wilson family made up of John, his wife Jean Elizabeth and their eleven children. You will truly be taken back in time as you come upon the family’s home and barn foundations, as well as their water well along your hike. The well is almost completely whole without any visible stones that have fallen out, and much of the barn foundation is intact. Seeing structures that have withstood sands of time like these really make you appreciate the hard work, craftsmanship, and dedication that would have been necessary to build these structures by hand at that time. An added feature of this hike is a plane crash that took place almost 50 years ago. On Saturday September 26th 1970, a small plane left what was then called the Toronto International Airport en route to Griffith Island with a pilot and 3 passengers aboard. Tragically, a fierce storm hit and took control of the plane crashing it into Silent Valley taking the lives of all four people aboard the aircraft. The wreckage of the plane still sits in the valley today and is marked on the Silent Valley Trail. Today the Silent Valley section of the Bruce Trail welcomes hikers and nature enthusiasts. 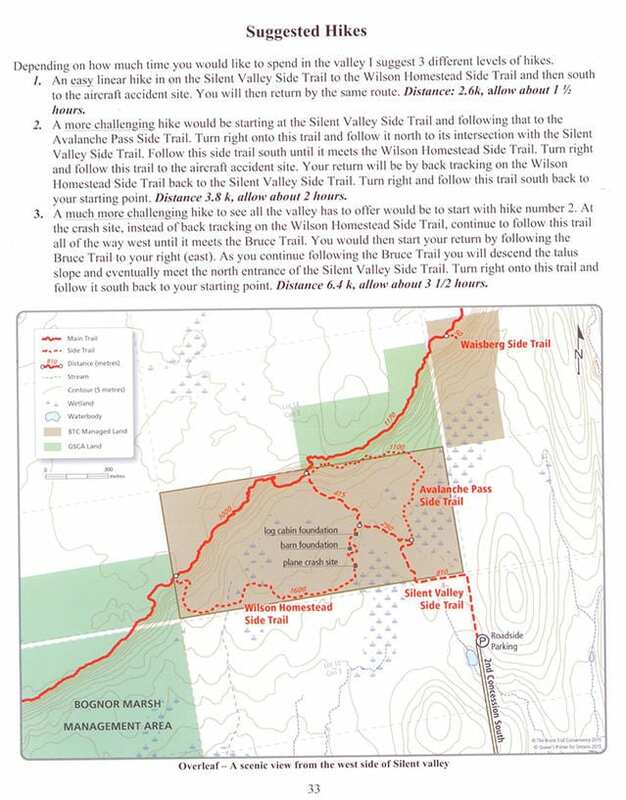 The map of the section can be seen below as well as some suggested hikes from Ron. If you would like to find out more about Silent Valley, Ron has written a book about the property that is available for purchase. I have a copy and it is filled with fascinating information about the land that is extremely intriguing and helped me write this article. The best part is that all proceeds made from the book will be donated back to the Bruce Trail Conservancy. For a hike not only through nature, but through history as well, Silent Valley on the Bruce Trail is a fantastic stop close to home!